Role of Brassinosteroids in the Plant Response to Drought: Do We Know Anything for Certain? 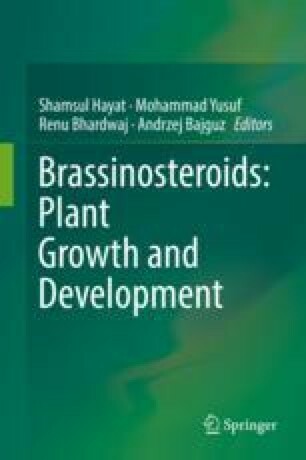 Brassinosteroids (BRs) are considered to be major players in the plant response to unfavourable conditions. They have been reported to alleviate stress symptoms and to enhance plant tolerance to various abiotic and biotic stressors including drought. However, our current knowledge of the role of BRs in the plant drought response should perhaps be limited only to the statement that the treatment of plants with BRs can mitigate the negative effects of this stress factor. No clear conclusions on the role of these phytohormones in the plant drought response should be inferred from the currently available data, because the results of BR/drought studies often differ quite substantially. This chapter attempts to provide a critical evaluation of the information available on this topic, i.e., data obtained either from plants treated with exogenously applied BRs or mutants in BR biosynthesis/perception. The existing studies are considered from several viewpoints regarding important aspects of their experimental design and attention is also drawn to some of their shortcomings. The question of whether BRs truly function as specific regulators of drought-induced response or whether the observed effects of BRs on drought-stressed plants are of a more general character remains unanswered.